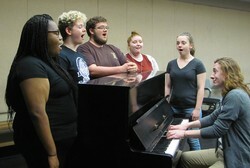 Student chorus members for the SFA School of Theatre's presentation of "(Biedermann and) The Firebugs," from left, Nychollete Easter, Houston freshman; Bayley Owen, Royce City sophomore; chorus leader James Burns, Troup senior; Kaitlyn Kirby, Plano senior; and Caitlin Bice, Flint senior, rehearse with junior music composition major Jesse Edwards, who has written the music for the show. NACOGDOCHES, Texas - Collaboration among university departments and programs sounds like a good thing. Faculty members and students working together across disciplines and learning from each other creates better opportunity for all. But in reality, cross-discipline collaboration can be hard. Departments establish routines and schedules that can make it difficult to align with other programs. For example, in most cases, theatre rehearsals take place in the evening, while music rehearsals happen during the day, followed by performances in the evening. "Although these scheduling matters may seem trivial, they have the cumulative effect of often stifling collaboration," said Dr. Stephen Lias, professor of composition at Stephen F. Austin State University. "So there are many schools in which the composition students wouldn't get the opportunity to score live theatre - or films, or dance, or video games. "We're lucky at SFA in that we have a supportive dean and other like-minded colleagues who all work together to make these things happen regularly," he added. SFA junior music composition student Jesse Edwards of Tyler is working with Dr. Rick Jones, professor of theatre, to compose music for the School of Theatre's upcoming presentation of the play "(Biedermann and) The Firebugs." It is the second time Jones has called on Edwards to compose music for a play he was directing. "For whatever reason, I tend to be drawn to plays that aren't musicals but include singing: I must have done at least a half dozen shows like that at SFA," Jones said. "So when we were deliberating about the Mainstage schedule for 2016-17, I gave Steve Lias a call, as I'd done numerous times in the past. Did he have someone who could help with 'By the Bog of Cats?' We talked about the specific needs of the show, and he suggested Jesse." For that play, Edwards wrote music to existing lyrics for two songs. "We worked very well together and the songs were really good," Jones said. "Equally as important, Jesse understood, probably better than some other students I've worked with over the years, that the people singing the songs are theatre majors who can sing, not voice majors. I called Steve again last spring about '(Biedermann and) The Firebugs,' and when he said Jesse was available, I jumped at the opportunity." Edwards has been composing for about seven years, starting as a high school student in Tyler where he wrote music for three of his high school's plays. As a freshman at SFA, his piece "Shipwreck" was premiered by the Orchestra of the Pines, and he's had numerous student commissions since. He was a Composition Fellow at the 2017 Alba International Music Festival (Alba, Italy) and placed third in last year's Dmitri Shostakovich International Composers' Competition (Lviv, Ukraine). He was a finalist in the Alfred Schnittke International Composers' Forum and Competition. He is currently commissioned by SOLI Chamber Ensemble to compose a piece for the group to perform in the 2018 Alba International Music Festival. But with all these accolades, Edwards says composing for theater is "starkly different from composing for concerts." "For one, the other artists involved operate in quite a contrasting world," he said. "Actors think, speak, create and perform differently from musicians. The vocabulary is foreign. The methods are dissimilar. Admittedly, there's a common thread, as they both involve similar essentials - communication, expression, nuanced performance - but it's a different world. It's like moving to a different country and trying to figure out how things work. It takes a lot of watching, listening and waiting. "So for this project, in particular, my approach was pretty typical to the way I approach any new project," he explained. "I waited, and I listened a lot to what was being said by the production team about the script and by the script about itself. I've found it takes a great amount of time when writing music for theater to absorb what the whole thing is trying to accomplish. You give it time, and once those answers are clear, the purpose of the music typically is also." While composing for "The Firebugs" is more intense and involved than his work on "By the Bog of Cats," Edwards said both experiences have been "amazingly positive." "Rick's great to work with," Edwards said. "He allows for a lot of creative freedom while also giving very clear direction." Jones' musical direction for this play: "the demon spawn of Kurt Weill and an oompah band, with a sprinkle of Broadway." "And that's what I got," Jones said. "Jesse is the real thing," Lias said. "He is smart, creative, self-motivated and a great team player. The talent and initiative he has shown since his arrival at SFA has made him (quite deservedly) a leader in our studio." "Writing music for existing lyrics has got to be hard enough," Jones said. "But I suspect that working with a translation, which is the case here, and which is likely to have more irregular rhythms than the original, must be an added challenge. "I think this ongoing cooperation between our programs is mutually beneficial," Jones added. "Our shows are better, and student composers get an approximation of a real-world gig." The School of Theatre and School of Music are also collaborating again to present the upcoming SFA Opera Theater, featuring W.A. Mozart's "The Magic Flute." Opera performances are at 7:30 p.m. April 12 through 14 in W.M. Turner Auditorium. Max Frisch's "(Biedermann and) The Firebugs" will be presented at 7:30 p.m. Tuesday through Saturday, Feb. 27 through March 3, in Turner Auditorium in the Griffith Fine Arts Building, 2222 Alumni Drive, on the SFA campus. The play is appropriate for all ages; however, young children probably would not understand it, while those in mid-teens and up would comprehend its themes. Single tickets are $15 for adults, $10 for seniors and $7.50 for students/youth. For tickets or more information, call the SFA Fine Arts Box Office at (936) 468-6407 or visit http://www.theatre.sfasu.edu/.